We streamed with Live stream and the original footage is no longer there, save for clips, we transferred to Youtube and some documentary footage we shot during the process. Then Posterous where we hosted the Info closed after their acquisition by Twitter. The loss of much of the archival footage and the lack of control we faced over them, has left me determined to create a platform to facilitate Creativity and technology but I help so many groups it’s time for a space. NEW YORK, NY, November 1, 2011—Computer hackers tweak technology to create unexpected results in cyberspace. With DANCEHACKIT™, Tony Award-nominated choreographer Marlies Yearby and fasionista/ tech guru Bonnie Sandy hope to create an extraordinary virtual performance, crafted by tweaking movement, music, fashion and technology on a global scale. 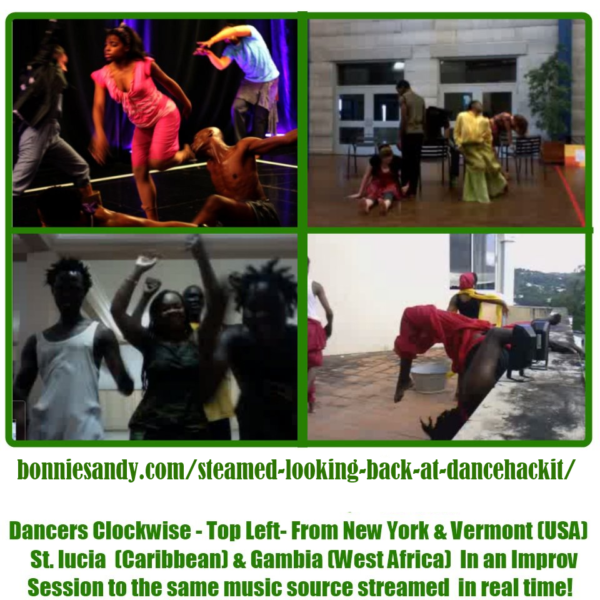 On November 19, from 2 p.m. until 4:30pm est, dancers from across the United States, the Caribbean, Europe and West Africa will perform to the same musical playlist, at the same time and in their own distinctive styles. Their improvisations will be remixed and streamed in real time on a wide screen to an audience at Long Island University’s Kumble Theater in Brooklyn (Flatbush Ave., between DeKalb Ave. and Willoughby St.) and online at www.dancehackit.com. DANCEHACKIT™ represents a new synergy between arts and technology. “Existing at the intersection of movement, music and technology, DANCEHACKIT™ is designed to remove the limitations of location by being virtual and globally accessible,” explains project Director and Co Founder Yearby. DANCEHACKIT™ will launch as part of the Brooklyn Fashion Film Festival (BKFFF). “Dancers will strut not only their movement style but also their fashion statements through collaborations between dancers and fashion designers,” notes Sandy, who serves as Director of Technology. Dance performers/leaders include Tracy Lang Dance (GA), Baraka de Soleil (IL), Marlies Yearby and Love/Forte, and Janelle Mahone (Gambia). Music by Oliver Lake, Wunmi and Slow Commotion, Vernon Reid, Morley Kamen, Dei Free Range Music, Groove Lily, Chen Lo and others will be featured. Participating designers include Kuumba Designs (St Lucia), Melissa Lockwood of IQTEST (NYC). DANCEHACKIT™ will end with a panel discussion with organizers and sponsors entitled Creativity,The Next Commodity: How Do Artists Master the Technology for Sustainability and Profit? “With Google launching 100 online channels and Comcast committing to at least eleven new channels, there is a need for innovative content. Artists have an opportunity to fill that void, but they first need to learn and adapt the technology. This is what we are doing here at BKFFF,” says Sandy. “On the viewing screen it really looked like all the pads were dancing one choreographed piece. If the music slowed the dancers across the pads slowed. It was something to see”. DANCEHACKIT is a new digital platform to share creativity and showcase fresh ideas. It removes the limitations of location by being virtual and globally accessible. Bonnie Sandy and Marlies Yearby, creators of DanceHackIt, MusicHackIt, FashionHackIt are already working out logistics for a replay of the dancing pads for virtual viewing and the further development of the platform. Posted in Latest and tagged Digital Space, Product Development, Steamed.